In twenty-four short essays, Professor Robert Thorp takes the reader on a guided tour of some of the most important archaeological discoveries in China of the last century. These sites start with the “cave home” of Peking Man near Beijing and conclude with the tomb of the Wanli emperor (d. 1620) in the Ming valley north of the capital. While some of these sites were always known of, if not excavated, many of these finds opened new chapters in Chinese history, art, and culture. Almost all are listed on the national register maintained by the State Administration of Cultural Heritage, and five are also inscribed on the UNESCO World Heritage list. The archaeological monuments of major capitals from the Bronze Age (Anyang, Zhou Yuan) and imperial eras (Nanjing, Luoyang, Chang’an) are introduced, as are spectacular tombs (the First Emperor’s terra cotta warriors, Suixian, Mawangdui) and rich Buddhist sites (Famen Si, the Mogao caves at Dunhuang) that have done so much to revise our understanding of China’s past. These compact entries are divided among six sections that establish an historical and cultural context for the discoveries without assuming any prior knowledge of Chinese studies. Each entry sets the find in its archaeological context, assessing how this material has affected the state of the field. Physical setting, plan and structure, contents, and dating of each discovery are laid out in clear prose with helpful maps, plans, and line art. Related discoveries and sites, including those in other areas, are introduced as well, and recommended readings take interested readers into each topic in greater depth. 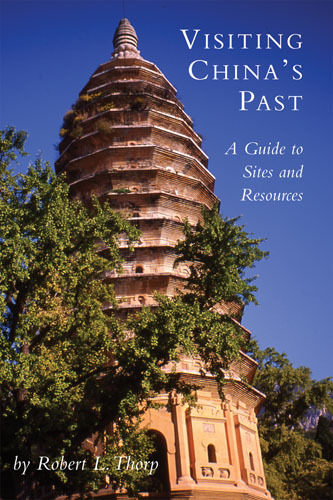 Visiting China’s Past also features an informative introduction to archaeology in China—its history, theory, and practice. A bibliography of English-language sources and an index to archaeological sites complete the volume, a useful guide for any serious traveler in China and a readable and reliable introduction to Chinese archaeology for anyone with an interest in one of the world’s most creative and long-lived civilizations. Robert L. Thorp is professor emeritus at Washington University in St. Louis, where he taught the archaeology, architecture, and Buddhist art of China. He is co-author with Richard Vinograd, Stanford University, of Chinese Art and Culture (Harry N. Abrams, 2001), and has recently published China in the Early Bronze Age: Shang Civilization (University of Pennsylvania Press, 2005). He is a frequent tour lecturer in China, and lives in Red Lodge, Montana.